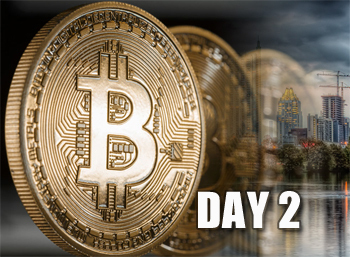 Five Days of Bitcoin in Austin: Day 2. Monday’s bitcoin experience went swimmingly. I found a taco truck that accepted bitcoin and ate well. My streak ended there. This week-long experiment came together in a hurry and living in the nascent bitcoin economy demands forethought, I discovered. Brokers – Coinbase and Bitpay are the gold standard for buying bitcoin. They not only offer clean user interfaces, but also allows consumers to buy bitcoin using their bank accounts and credit cards for a 1% fee. Although this method is the easiest, I discovered its downside — it takes up to five days to receive your coin. Exchanges – Exchanges such as BTC-E, BitStamp, and BitFinex also sell bitcoin. While receiving your bitcoin after purchasing from them is nearly instantaneous, converting fiat currency (e.g. USD or Euro) into bitcoin requires identity verification, which can take days and requires submitting sensitive information to exchanges with questionable practices. In person – Enthusiasts can visit meetups or Austin’s Satoshi Square and directly buy bitcoin from others and pay in cash or whatever medium the parties agree on. The only downside to this approach is that these transactions typically carry unfavorable exchange rates. I decided to use Coinbase and therein was the source of my problem. I won’t receive the bitcoins I bought last Friday until this Thursday, leaving me with only $48 of bitcoin I already owned, which is a lot less than my usual $150 weekly budget. Hopefully this won’t be a problem. My second problem arose on Tuesday night, when I had to pay rent for my band’s rehearsal space. Thankfully, Matt, my drummer, was secretly a bitcoin investor. He not only got wild eyed when I asked him if he would accept bitcoin, but also talked to me about bitcoin at length . He heard about bitcoin from a friend and invested in it when it was $450 per bitcoin and still holding. When bitcoin enthusiasts talk about their introduction to the crypto-currency, they don’t use dates, but the conversion price, which serves as badge of honor (“I got in when it was only $1 a ‘coin!”). At the rehearsal space, Matt opened up his CoinPocket wallet and produced a QR to receive payment from my CoinBase wallet. (Bitcoin apps typically use QR codes to identify recipients and senders). Then we hit my third problem- my phone ran out of batteries. Without electricity bitcoin doesn’t work and without a charger I couldn’t pay my rent. Matt agreed to be paid back later that night. My last problem didn’t arise until lunch the next day. Using Coinmap, I found the Unconventional Oven, a food truck specializing in pizza. The eatery even proudly advertises accepting bitcoin on its website. My luck — not only did I get to eat delicious tacos during my experiment, but also five star reviewed pizza! My mouth was watering dreaming of their margarita pizza until I landed on their Facebook site and discovered that the truck had closed permanently. At this point, it was around 1 p.m. and my primordial need to eat was kicking in. I Googled and Googled until I discovered Menufy, a restaurant ordering platform that allows restaurant to accept bitcoin payments. Score! I won’t be going hungry today. I was getting pizza from Cozzoli’s, a pizzeria down the street from my office. With a few clicks, my lunch was on its way and 0.0141561 BTC (at $623.05 per bitcoin) was on its way through the virtual ether to Cozzoli’s. When I got to the pizzeria, I talked to the server about bitcoin. He had no idea that his pizzeria accepted bitcoin and was excited to hear more about it. Between my explanation of the blockchain and Satoshi Nakamoto, the recluse engineer behind bitcoin, I lost him. 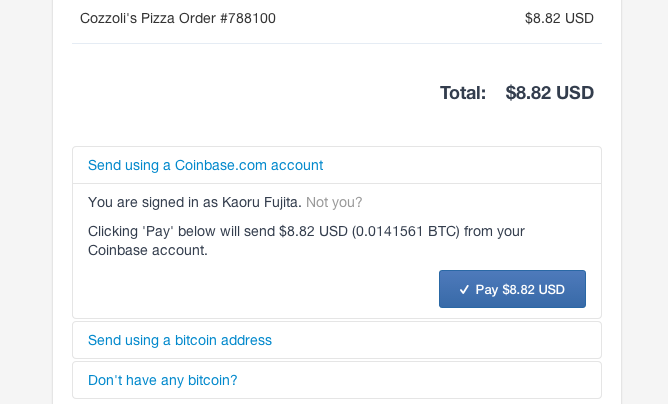 “Would Cozzoli’s ever directly accept bitcoin?” I asked. He responded by pointing to his antiquated point of sales system and shook his head. Thank goodness companies like Menufy and Coinbase are making it easier for merchants to accept bitcoin, even if merchants don’t fully understand the technology. It’s my third day living using bitcoin and I’ve managed to feed myself and pay rent. Besides from the inconveniences caused by my lack of planning, my only qualm is that my food choices are limited to eating at fast food restaurants and grocery shopping at big box stores. The only grocery store that accepts bitcoin near Austin is in Leander, Texas — a distance too far for my scooter. I’m on the hunt for healthier food. Editors note: This guest post is the second in a five part series on using only bitcoin in Austin, Texas. Check back soon to see the next parts.